← Lemon-Garlic Zucchini Salad with Walnuts & Ricotta Cheese. Trim the zucchini ends. Using a spiralizer, juilenne peeler (or regular peeler) peel into noodle-like sticks; transfer to colander and sprinkle with salt. Set the colander in a bowl to catch the excess moisture. Grate all the zest from the lemons, then juice the lemons; transfer both to a medium bowl. Peel and mince or press the garlic; transfer to the bowl, whisking together with oil, lemon juice, and pepper. Place a skillet over medium heat. Coarsely chop walnuts. Toast walnuts until fragrant (2-4 minutes) stirring regularly. Pick the basil leaves off the stems and slice into ribbons. Shake the zucchini noodles in the colander over the sink to remove excess water. Transfer the noodles to the centre of a clean towel, roll up the towel and wring it over the sink to remove as much moisture as possible (you should squeeze out at least ½ a cup). Process in batches if necessary. Add zucchini to the bowl with the dressing and toss until coated with dressing. 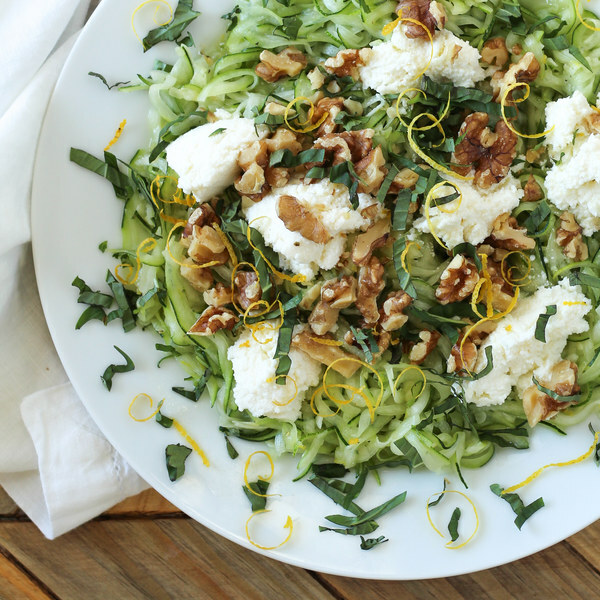 To serve, arrange zucchini noodles on a plate and top with walnuts and teaspoon sized scoops of ricotta cheese. Sprinkle with basil ribbons and enjoy!